Sunday Reporting and a shout out to Anita! My stash hasn’t changed much. 2/3 of a yd out for binding. Oh! I had to come back and add a yard I forgot about! I have gifted a yard to someone, they just don’t know it yet! So 1 & 2/3 yds out of my stash this week. Outgoing Yardage to date: 118 & 1/12 yds. Total Stash Busted to date: 34 & 1/12 yds. Today’s post is mostly for my dear, sweet friend…Anita. We became best friends in high school. Life has kept us apart from each other, physically, for about 12 years now. But the quilt I have on the machine now is Anita’s. This is a very special project for me! Twenty-seven years ago, would you have thought we would be working on a quilt together? 🙂 A little sneak peek for you, so you can tell me if you think I’m on the right track. Now do tell me if you don’t like it! I’ll pick it out and start over! Really! Working on this today got me thinking about this. The critters on this quilt are fabulous! The snail is just so so cute. He (and I use the term loosely) is by far my favorite. What an incredibly beautiful afghan! Anita’s family’s love certainly shines through on it. Beautiful ! Randi, the quilting is just darling. Are these all freehand? Love the critters and I’m sure Anita will too. Love the afghan and the story. Randi, I love the designs. 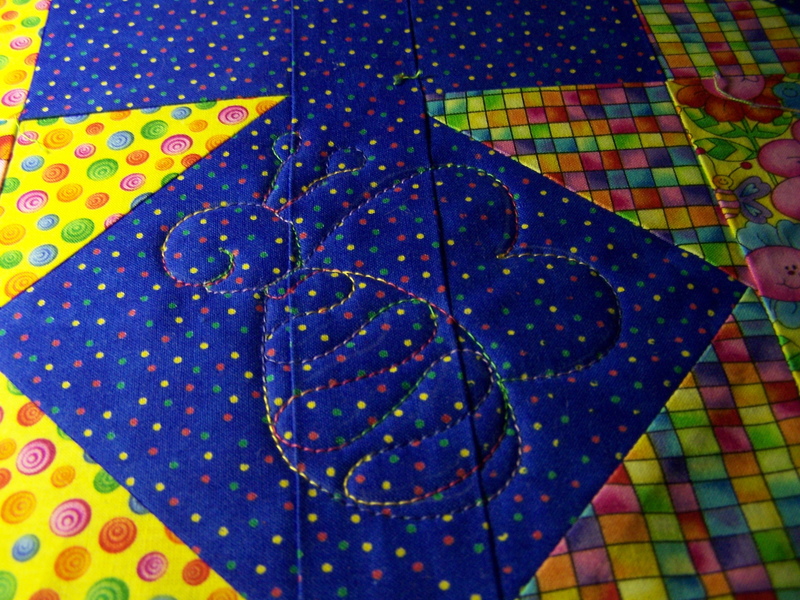 My daughter’s middle name is Bee (after her grandmother) and I am making her a bee quilt. Can you tell me how to get a copy of the bee design; it would be perfect. I like everything. Love the animals. Keep the afghan! Oh, Randi! Your quilting is perfect! I love these little bugs! I think the afghan is a wonderful and treasured gift. You are blessed to have such good people in your life! The story is wonderful Randi and so is the quilt. It feels so good to have great friends. I LOVE the bugs. So cute! You are so darn clever…I end up committing the sin of envy each time I visit here…….but it is also inspiring. I will never do it this well…..but I can keep trying. And oh I am soooooooo trying. Hugs and keep up the great work. Oh my gosh….I LOVE IT! That quilt is too cute and your quilting is perfect for it!!! Those critters are just too cute Randi! 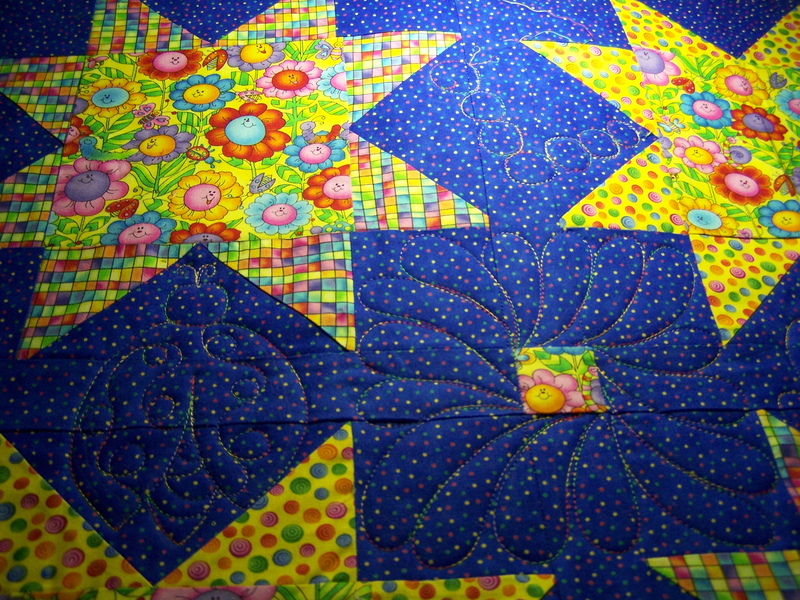 And perfect on what we can see of this quilt. 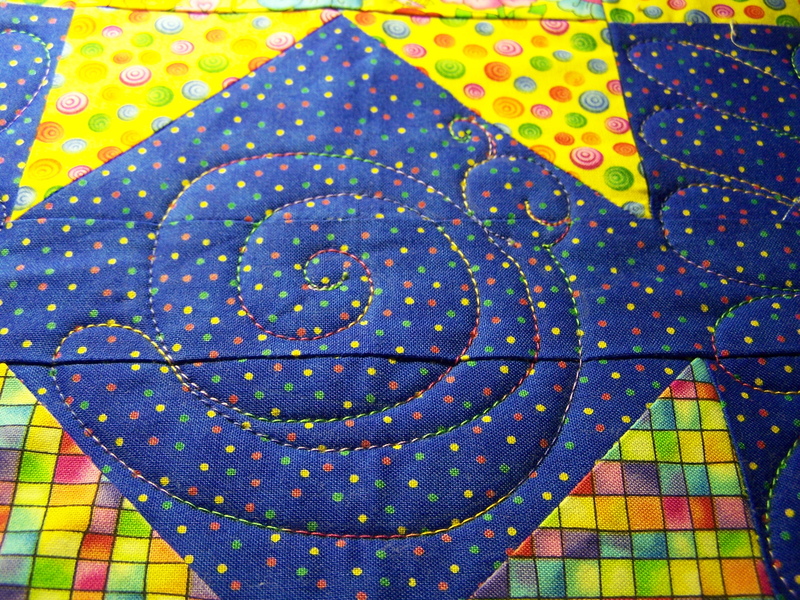 Randi – I just love the quilting in your bright quilt for your old friend. The snail is so cute. The caterpillar, flower and lady bug are wonderful, too. But my fav is that bee. What a fun quilt. I bet she loves it. Your quilting is just perfect for this top. 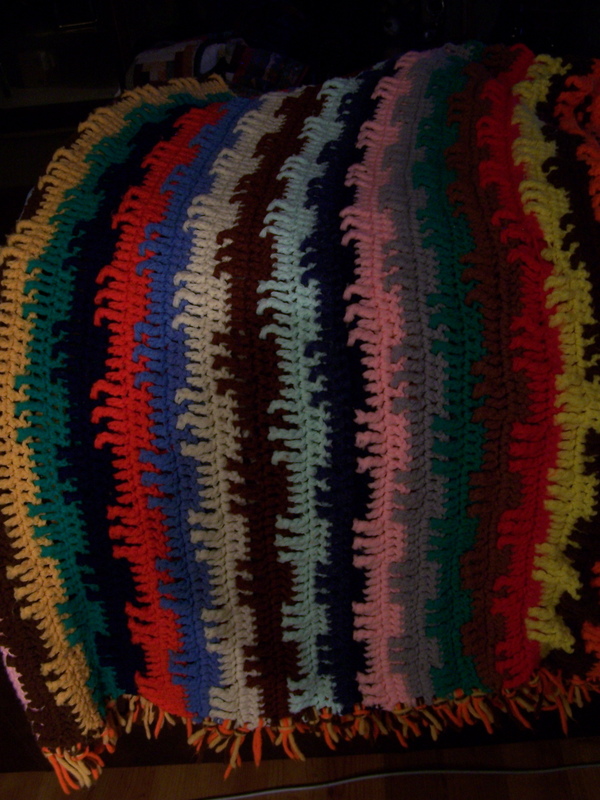 I love the scrap afghan – my first marriage lasted 5 years and my boys were pretty much the only thing I took with me! « Tagged! And a blog commenting question.